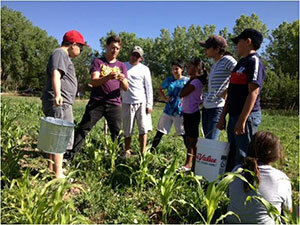 Agriculture has been a way of life in New Mexico for centuries. The communal irrigation canals, or acequias, and the lands they water have been passed down by family farmers generation after generation. Today, New Mexico is returning to its agricultural roots as a way to revitalize its cities. Espanola, New Mexico, a town of just under 10,000 people located 22 miles from Santa Fe, is leading the way with a regional food hub initiative to connect farmers with consumers while bringing new life to the city’s downtown. A collaboration between the city of Espanola, Rio Arriba County and the nonprofit community development organization, Siete del Norte, the food hub will be housed in the shell of a vacant building, formerly a car dealership, in Espanola’s downtown. Developing agricultural resources has been in the region’s plan for the last eight years. The desire to aggregate the food production of small local farmers to meet rising demand has resulted in a pilot farmers program, state funding in the form of a bond, a partially donated city owned building, site rehabilitation funds from the county and operational funding from Siete del Norte. “These operations and enterprises don’t take off overnight; they are very intensive, you have to do it slowly and successfully to make them successes,” says Todd Lopez, President of Siete del Norte. By partnering with stakeholders around the state, Siete del Norte helps revitalize properties while stimulating local economies. Classified as a Brownfield site, or EPA Superfund site, the food hub building like many of the buildings in Espanola’s downtown had contaminated ground water from a former laundry facility in the area, and thus cleanup has delayed the project. Comprised of 25,000 square feet of useable space, the building will house a 6,000 square foot food hub, a store front for the Espanola Community Market and a community center. The Northern New Mexico Heritage Alliance commissioned murals for the exterior of the building to help grow public awareness of the space. “The whole purpose is to make sure our ranchers and farmers do better, so that they maintain their land as farming and ranch land and maintain our water rights so that we may continue those water rights for our sustainability into the future,” says Madrid. A pilot program initiated by Siete del Norte in neighboring Mora County proved that aggregated small farm production could be sustainable in the region. Ten farmers were provided with business training, marketing assistance and technology for one year. After a successful year, the ten farmers became mentors to 25 other growers in the region. Lopez anticipates that the Espanola food hub will initially aggregate produce and value-added products from approximately 150-200 farmers, the number of current farm vendors at the Espanola farmers market. “Ultimately, the idea really is to grow that number significantly, but also to better equip those farms that are already in place,” says Lopez. A farmer from neighboring Mora County, Roger Gonzales will serve as the food hub manager. Working with a 35-member farmer cooperative in his own county, Gonzales will bring his experience of farming, advocacy and sustainability education to the new food hub. The stakeholders are currently negotiating a lease with the University of New Mexico for an underutilized commercial kitchen that would function as a supplemental facility for the food hub. After the bond money from the state is processed, Madrid anticipates a planning session this September with rehabilitation of the building beginning in earnest this fall. If all goes well, the food hub should be in operation by spring of 2015.